This simple operation on Regent’s Canal towpath (near the Whitmore Bridge) was a novelty when it opened in 2010 in three shallow units. 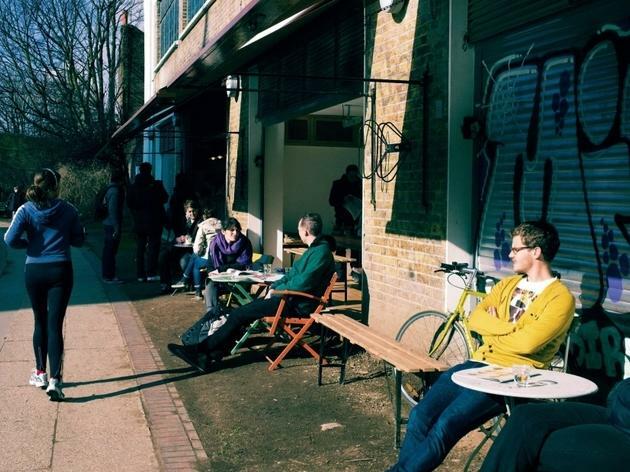 Three years later, it has expanded into four units, and continues to lure in passing walkers and cyclists with its original setting and enticing food and drink. Wing a table in the sunshine on a summer’s day, and you might end up staying for hours. Relaxed entertainment is provided by families of swans, coots tending their nests, and passing bikes whizzing by. Our last visit, however, was a rainy affair – yet it proved that Towpath shouldn’t only be reserved for fair weather. Huddling inside the covered, homely (think beaten-up furniture and cultural posters) open unit watching rain pummelling the canal was a comforting experience, made more so by the addition of delicious grilled cheese sandwiches and decent coffee. Come here for breakfast and the menu will usually include fried eggs on toast or granola with yoghurt, fruit and maple syrup. In the afternoon or early evening, choose from a range of alluring cakes (the beautifully light olive oil and lemon cake is a favourite) or savoury dishes such as pork tenderloin or own-made quiche. Amazing atmosphere next to the canal, great people at the service and tasty simple food. I would just suggest to have at least one milk free milk option for the great coffee they are making. Towpath is pure love whether it is sunny or rainy (big bonus if it is sunny!). 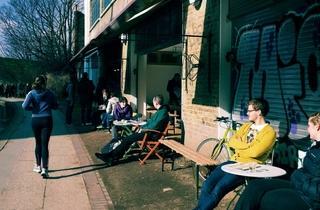 Excellent coffee, fresh juices (small glasses though), delicious cakes and the best grilled cheese sandwich in London! There is a blackboard where they write down the menu of the day - I think only during weekends. The views are wonderful but it can get annoyingly busy sometimes. Just relax and enjoy the vibe and the retro decor! Really a must do of East London. Love grabbing a quick coffee here on a sunny morning and relaxing while the ducks, joggers and cyclists duke it out over who rules the towpath. it's not cheap, but it is lovely. LOVE this place. Last time I went, I was amazed by a chargrilled chicken with figs and roasted onion, the best meal I have had in a long time!! For about a tenner, completely worth it. The staff has always been really pleasant to me, and the whole place has such a chilled, friendly vibe to it... It makes me happy every time I go! Had drinks here last night with a group of friends and loved it! Great setting, delicious wine and quality beer but this place excels due to the brilliant service - Lori and her staff are clearly passionate about what they do with infectious smiles and warmth. Thank you Towpath! Rude, expensive, unpleasant. Wish I could have loved this place and the people who run but its just too awful. A jar of warm white wine was seriously over priced and the staff were just nasty people. Keep your horrid out of Hackney! First time been moved to post a review, had to because I've just had probably my best meal of the year, and it was lunch! Actually, honestly, sensational. Pitch perfect cumin lamb, incredibly tasty spiced cauliflower and stunning crispy chickpeas. Incredible combination. I couldn't believe how good it was. The only meal I've had to rival it this year was a Bruno Bistro Loubet. The lady chef who works at the Towpath is seriously talented, her food totally, completely wowed me. No joke. Its the kind of food you long to find in London and just never do. My mate tried my dish an was rendered similarly speechless. We both agreed we'd happily pay twice what they charged and still think we got great value, spectacular food. There was a lot of expletive ridden superlatives flying about at our table! Lori and her staff are brill!!!! not only do they make the meanest grilled cheese sandwich but they also love and care for the canal and its surroundings investing their own money in providing bike parking spaces and beds for plants. A template many businesses should emulate. Starbucks it aint!!! London at it's best. A real gem. Probably my favourite coffeshop in town! Perfect location, coffee and super-friendly staff! try the olive oil cake!